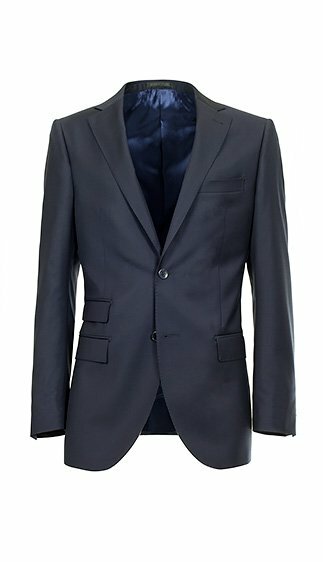 Our tailored men’s jackets, entirely made in Italy and with Italian fabrics, are authentic garments that can be easily customised. For formal workwear, a special occasion or to simply add an additional touch of elegance to your everyday wardrobe. The half-canvassed structure, puckered Neapolitan shoulders, armholes with staggered seam and working sleeve vents are just some of the premium sartorial details that have been handed down from generation to generation. Made in Italy with the best Italian fabrics, Lanieri made-to-measure jackets are essential for all the seasons and should be in every man’s wardrobe. Read the guide and find out more about our tailored men's jackets. Comfort and fit exactly where and when it is needed. The perfect wearability of our tailored jackets is also obtained thanks to the special natural canvas that extends from the shoulder down through the chest. This construction, known as half-canvassing, provides the garment with a better fit and makes it more comfortable to wear. Made by hand by inserting ultra-light padding where the sleeve is attached, puckered Neapolitan shoulders provide the upper part of the jacket with more shape and structure. That artisan touch that provides each and every tailor-made jacket with true sartorial style. Working sleeve vents and real buttonholes. Two details solely synonymous with quality men’s jackets. To be customised with the buttons of your choice. You can customise your jacket with the details of your choice, but there is one feature that we have chosen to forever keep the same. All of our formal jackets have a left Neapolitan breast pocket, which is shaped like a small boat.